Henna is a natural plant product. Some Henna powder sold is mixed with salts and other chemicals to achieve a different colour. This Henna has nothing added, it is pure and natural henna powder from the middle east. The natural colour that henna will give you will depend on the colour of your hair at the outset, but in general this will colour your hair a copper/red colour. The longer it is left on the deeper the colour achieved. Mix with water into a paste, sort of toothpaste consistency, leave for an hour, then coat all your hair with the thick paste, starting at the roots and working your way up the hair; make sure that all your hair is well coated, wrap your hair in a shower cap/cling film and leave for required time, this could be anything from 1hr to 8hrs the darker your hair the longer you probably need. Wash off thoroughly with warm water and then shampoo for best results – this may take some time and can be messy. If you don’t like the colour too bright, especially if you are quite blonde, add a tablespoon of coffee, this will dampen the redness. Remember to wear something you don’t mind messing up as henna spilt on your clothes will dye. I suggest a dark coloured t.shirt and use an old towel. True henna will only make your hair go towards red zone. It cannot lighten hair or change the colour. 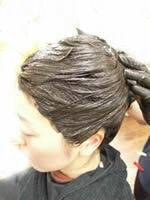 Adding other ingredients will produce a more subdued red or push hair into browner or golden tones. The darker your hair at the start the more subtle the henna red will be. It will be gorgeous in the sun though. Very Dark brown to black – Mainly red tones in the sun. Grey – difficult – can sometimes make hair orange – always do a strand test first. Slight colour changes can be achieved with mixing other ingredients. Indigo Powder – dark/blackish (USE WITH HENNA) unless you want a grungy blue colour! Don't forget that indigo used on its own will NOT give a good colour - indigo needs to be mixed with henna or used after henna application. 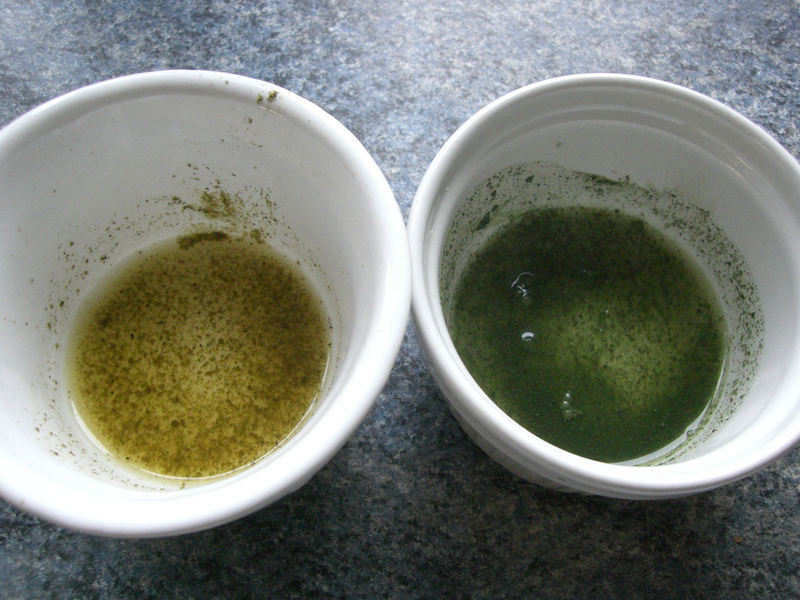 This photo shows the first clump with henna and indigo mixed whilst the second clump has had only indigo used. The natural colouring of the hair used is very light with extensive grey. The longer you leave the mix on the more intense the colour, these colours were achieved in 20mins. The darker your hair is at the start the darker / red the henna will dye and if indigo is added the darker black your hair will be. The first pot here shows henna with added water and the second pot shows indigo with water. The difference between the two is clear. Whilst henna is a golden brown colour indigo is a dark pea green colour. Henna smells earthy and leafy whilst indigo smells kind of like frozen peas. Henna freezes well so if you mix too much you can keep it for next time however indigo does not freeze or keep well and will loose its dyeing properties so ,mix up what you need and only. If you don't like the smells (personally I love the henna smell but not indigo) add a few drops of your favourite essential oils to the mix.